Fiction – paperback; Penguin Books; 108 pages; 1958. Translated from the French by Irene Ash. 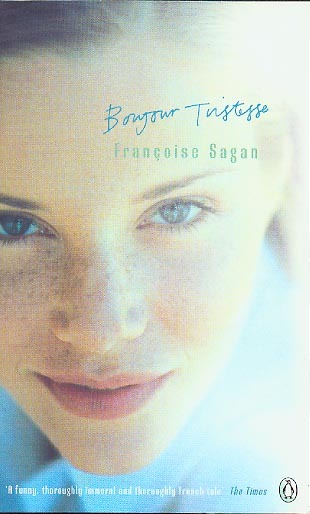 Françoise Sagan’s Bonjour Tristesse is a deceptively simple book about one girl’s plan to prevent her father, a self-confessed libertine whom she loves very much, from marrying a beautiful but aloof woman. But when 17-year-old Cécile enlists her first real boyfriend, Cyril, and her father’s ex-lover, Elsa, to take part in her devilish scheme, she fails to imagine the horrific consequences of her actions. Set on the French Riviera, you can almost smell the ocean air and feel the warming rays of the sun, as Cécile tries to find excuses to avoid her studies (she has recently failed her exams and must sit them again) and spend time with Cyril. Together with her womanising 40-year-old widowed father, his lover, Elsa, and his late wife’s friend, Anne, she enjoys a two-month holiday in a secluded villa. But when Elsa is ousted in favour of Anne, Cécile’s equilibrium is destroyed. As much as she admires the 42-year-old Anne (a much closer and more ‘appropriate’ match to her father than the 29-year-old Elsa), she views her as a threat to her carefree existence, a mother figure who will impose rigid controls and order on her life. And, to a certain degree this is true, because one of the first things Anne does is forbid Cécile from seeing Cyril — later she imposes homework rules and at one point locks Cécile in her room so that she cannot escape her books and essays. Bonjour Tristesse (Hello Sadness) scandalised France when it was first published in 1954 because of its portrayal of ‘free love’ (a man openly living with unmarried woman, a teenager who drinks alcohol and sleeps with her boyfriend). Astonishingly, it was written by a 19-year-old unknown, and promptly became a best-seller. I say astonishing because Sagan cuts to the very heart of complicated human relationships using austere, almost clinical, and restrained language. It seems, in many many ways, as if it were written by someone old before their time. It’s a beautifully tragic story, tinged with melancholy and regret, which perfectly captures the naivety and rebelliousness of youth. It’s a quick and easy read too, but one that makes you think and ponder for a long time afterwards. It is very reminscent of Truman Capote’s Breakfast At Tiffany’s and Jean Rhys’ Voyage in the Dark. I have had this on my bookshelf for ages. I really have to pull it out and read it! Danielle, it’ll only take a couple of hours to read – and is well worth it. Oh this sounds really interesting. I’ll keep my eyes peeled. I’m now going into a reverie thinking of films like Francois Ozon’s Swimming pool and imagining all of these dramatic and complicated French female characters. Does anyone know where I can find an English version of the book online? I’m Having a hard time getting through it in French. My review of this went up today Kim (in fact I must link back to yours and Simon T’s reviews – will go edit in a mo) and I thought it was a marvellous novel. It has faded slightly, I thought it was AMAZING when I finished it a week or two ago, now I think its is very, very good (there is a difference ha). Like you its how Sagan at that age managed to capture human emotions, manipulations etc of people much older than her. I thought that was incredible. Thanks for letting me know about your review, Kim. I’ll add a link in the comments. I completely agree with your point about it feeling as though it had been written by an older woman or someone old before their time. It’s actually very poised and mature for the work on a teenager. That’s an interesting thought about the comparison with Voyage in the Dark. It hadn’t occurred to me at all even though we were only talking about it yesterday.! That’s very kind, Jacqui. Reading your review was a lovely reminder of how much I’d enjoyed this book all those years ago (this review was written in 2006)! !